In the wake of Army’s 34-7 defeat at the hands of the Naval Academy, making it twelve straight years Navy has defeated Army in the nation’s purest rivalry, Army has dismissed Head Coach Rich Ellerson. Many Army fans across the nation may want to hear this but it might be time to look to Navy for Ellerson’s replacement. Navy has only missed bowl season one time since 2003, and the Commander-In-Chiefs trophy has more or less found a home in Annapolis. Under the leadership of Paul Johnson and Ken Niumatalolo in conjunction with athletic director Chet Gladchuk, the Naval Academy has found a system to achieve tremendous success at a service academy. Each service academy faces circumstances that make each job uniquely challenging. Army certainly has it’s challenges, even in relation to Navy. These are not circumstances that cannot be overcome. Army has a rich tradition of success on the gridiron. The United States Military Academy can once again attain success in football. Making the phone call to Annapolis and hiring their next football coach, would not be a bad place to start. In my opinion there are three tremendous and viable options, no pun intended, for Army to hire their next coach from among the coaches at Navy. Why It Should be Ivin Jasper – I wrote two years ago when the Head Coaching position was open at Hawaii, that Ivin Jasper would have been a tremendous choice to lead the Hawaii program. The Warriors have struggled since hiring Norm Chow going 4-20, and there are grumblings on the islands about the state of the program. At some point Coach Jasper is going to get his chance to lead a program of his own. When Paul Johnson left to take over the program at Georgia Tech after the 2007, Ivin moved to the spotlight offensively at Navy. Under Jasper the Navy offense never took a step backwards, proving that the Navy machine would keep humming along after Johnson’s departure. They’ve won the C-I-C trophy in four of the six seasons Jasper has been at the helm of the offense. Ivin has coached both Ricky Dobbs and Keenan Reynolds. The former broke the latter’s NCAA rushing touchdown record last week. Reynolds will likely go down, statistically as the greatest Quarterback in Naval Academy history. The national media may shun the idea, but Keenan Reynolds should seriously be considered a Heisman Trophy candidate for the 2014 campaign. Ivin knows how to develop academy type players, and has shown that he can develop an offense that can not only compete but beat FBS level competition every season. Why It Should be Ashley Ingram – Ashley Ingram was promoted to Running Game Coordinator along with his duties of offensive line coach last season. Coach Ingram has been the centers-guards coach at Navy since 2008. Previously he served as the offensive coordinator at Bucknell. Ashley has been instrumental in developing the offense along with Coach Jasper. Navy is currently #2 in the nation in rushing offense per game. Since Coach Ingram’s arrival the Mids have gone 48-29. A portion of this success is tied directly to the recruiting prowess of Coach Ingram. Responsible for the recruiting areas of Tennessee, Georgia and North Florida, there are over 30 players currently on the roster from those areas. Similar to Coach Jasper’s development of quarterbacks, Ashley Ingram has done a tremendous job developing linemen to succeed at the academy level. Naval Academy linemen are usually at a decided physical disadvantage compared to the players along the opposing defensive lines. In the run heavy Flexbone at the collegiate level, there is a tremendous amount of pressure on the offensive line to perform. The centers and guards may have the most difficult job, because they are responsible for blocking defenders who cannot be read (midline excluded). Coach Ingram will get his shot to be a head coach. Army would be smart to make that time now. Why It Should be Buddy Green – He’s been at Navy for the last 12 seasons, coinciding with the current win streak Navy enjoys over Army, serving as defensive coordinator. Although not always pretty Coach Green has done a tremendous job with service academy defensive players. Any football coach will tell you that you can at times succeed on offense with inferior players, but on defense there is nowhere to hide. The Army defense has struggled, especially the last two seasons, surrendering 424 points last season, and 379 points this season. 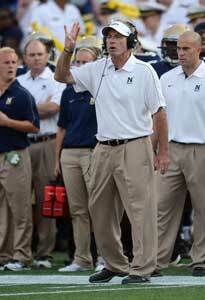 Under Coach Green’s tutelage the Navy defense has remained competitive, allowing the team to stay in football games. In only one season in the last ten has the Navy defense given up 379 or more points. Coach Green will help shore up the defense, and likely bring in a coordinator to run the Flexbone, allowing them to be competitive, much in the same vein as Navy is now. What these three men have in common, along with being tremendous football coaches, each of them have shown success at a service academy. They can recruit and develop the type of young men willing to attend and play football at a service academy. All three of them have been instrumental to the renaissance of Navy football over the last twelve years. They can do the same at Army if given the call. While I understand the desire to hire a coach with ties to Army, it’s time they look to Annapolis to rebuild the Army football tradition.